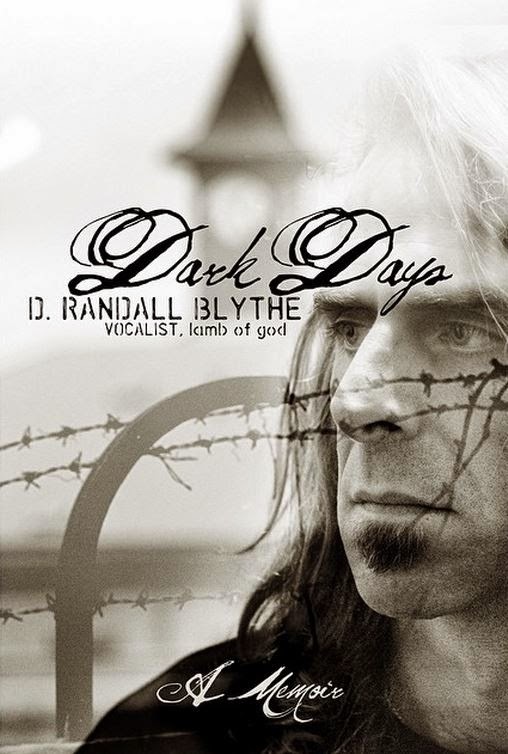 MetalRockNews: Lamb Of God's Randy Blythe talks about his new book "Dark Days: A Memoir"
Lamb Of God's Randy Blythe talks about his new book "Dark Days: A Memoir"
"The cover was designed by Paul R. Brown of Bau-da Design Lab. Paul is a photographer, director and graphic designer who has worked with a million bands on album covers and videos, as well as doing book covers for Nikki Sixx, Marilyn Manson, Motley Crue and my pal Corey Taylor." "The two photographs incorporated into the design were both taken by me. One is of Pankrác prison, I took this photo when I went back for trial, the other is a self-portrait. "I put on some extreme right wing talk radio and hit a remote shutter button a million times. I wanted to make sure I had forgotten about the camera so I would get an 'honest' photo. The radio did the trick. I was highly disturbed listening to their insane rantings and that was what you see in the photo. "I did not want my photo on the cover of the book, as it is not really a typical 'rock memoir' and there are more than enough photos of me out there already, but it is my first book, so I acquiesced to the publisher's request. At least it's not a cheesy 'author/rock singer' photo, just me hanging out in my study, thinking about how nutty some people are. Note that the subtitle at bottom is simply 'A Memoir', not 'My Trials & Tribulations'. I hated that, but we needed a working subtitle and someone else threw it out there, and before I knew it, blam it was up on Amazon." "Speaking of which, the book is available for pre-order there (probably still with the 'working cover.'" "In 2010, a nineteen-year-old super-fan rushed the stage during a Lamb Of God concert in Prague. To protect himself, singer Randy Blythe pushed the fan away. Unbeknownst to Blythe, the young man hit his head on the floor when he fell and later died from the injury. Blythe was promptly incarcerated on charges carrying a prison term of five to ten years. Thirty-seven days later, he was released on bail to await trial. Although legal experts told him not to return to the Czech Republic to face the charges, Blythe explained that he 'could not run away from this problem while the grieving family of a dead young man searched hopelessly for answers that he might help provide.'" "This book will tell that story, the whole story, for the first time ever. I'm the only one who lived it, so I'm the only one capable of telling it. However, the tale of my arrest, incarceration, release, and trial are merely the vehicle I will be using to convey what I feel is an important message in today's fast-paced, high-tech, self-centered world. I have something to say, and life has presented me with a tragic way to illustrate my point without being preachy or pedantic. "I will not moralize or shout from some ludicrous ethical pedestal (I didn't win the Olympics or cure cancer, I went to prison, for Pete's sake) I just want to relate how I got through a very scary time and came out with my head held high. I think there is a lesson of value in the telling of my story, if only for myself. Therefore I will write it, and I hope some of you will read it." "While I've dreamed of being a published author almost since I began to read, I never imagined my first book would center around such a sad topic, sometimes though, life unexpectedly provides you a story that needs to be told. I believe this one does (for several different reasons, not just for the benefit of myself), so I will tell it with the respect and dignity all involved deserve. This will be a good read, I promise you, and I hope some good comes of it." Executive editor, Ben Schafer added: "I knew that Randy was a master vocalist and lyricist but it turns out he is a vivid and visceral prose writer as well." "Regarding his arrest and trial in the Czech Republic, Randy handled a frightening and heartbreaking situation with courage, grace, and humility, and we at Da Capo Press are honored to have the opportunity to have a part in telling his story."